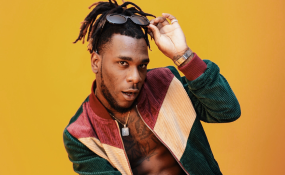 Nigerian afro-fusion artiste, Burna Boy whose real name is Damini Ogulu, has signed a music publishing deal with Universal Music, USA. The deal comes months after he released his last studio album Outside which has been getting rave reviews ever since its release in January under Atlantic Records. According to the statement, the deal will give him the privilege to manage his songs and ensure he receives all the royalties from the back end as he is entitled to. The statement read "This deal will also seek and issue licenses for Burna's work. This is, of course, in addition to administrative duties, tracking, exploitation of copyrights, and collection of monies generated from the exploitation of those copyrights." The new deal also comes after Burna Boy enjoyed benefits off the confusion stirred by the release of America hip-hop star, Kanye West's eight studio album "Ye".